IPAR is delighted to welcome to our ever-expanding team a member of the Australian Women’s Hockey team (‘The Hockeyroos’), Ashleigh Nelson. Ashleigh, a qualified Occupational Therapist, has joined our Perth office as an Injury Management Consultant after previously working in extended rehabilitation with Aged Care and Stroke in a clinical and community setting. 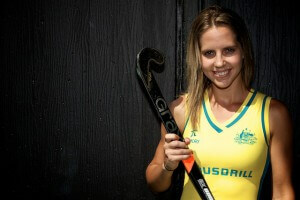 Alongside her rehabilitation career, Ashleigh is a striker for the Hockeyroos, making her international debut in 2007. Since then, she has enjoyed a number of highlights, including a Commonwealth Games Gold Medal (Delhi) in 2010, being the Hockeyroos highest goal scorer in 2010 and being selected for and playing in the team for the 2012 London Olympics. Ashleigh is looking forward to applying her dedication and team work to her Injury Management role with IPAR, expanding her skills and knowledge in a new area of Occupational Therapy.